Aside from the addition of “Login” and “Register” links to the upper right corner of the Zotero site, you might not detect many changes. The most visible difference is new unified login functionality to support the site’s various functional modules. 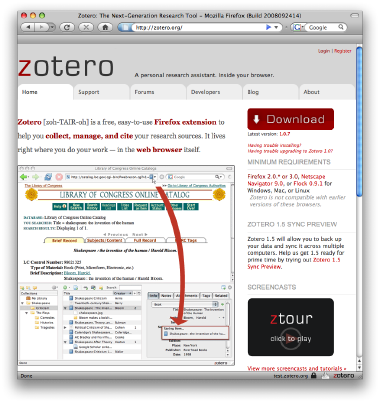 Users can also now use an OpenID account to authenticate with the Zotero site. Beneath the surface, the guts have been been entirely reworked. Zotero’s web application team, led by Jon Lesser, has created a streamlined new architecture designed to support the vast array of innovative, web-based functionality that we will begin to roll out to users beginning this month. Stay tuned! This entry was posted in nerd and tagged syncing, zotero on 11 November 2008 by Sean. For whatever it is worth, the new system seems to have quirks for me. On Firefox on multiple machines, I get A “Welcome|Settings|Logout” message at the top right, as if I was successfully logged in. However, the forums still show “Not signed in (Sign In)” & I am unable to post messages. IE-6 does not appear to have this defect, but I am not usually on a system with IE & the styling of the page in at least this particular version of IE leaves a lot to be desired. There was a problem related to cookies that should be fixed by now. If you still have problems, you can try deleting all “zotero” cookies from Firefox, restarting the browser, and trying again.